In 1242 the Teutonic Knights were conquering lands to the east into Novgorod. Pope Gregory IX blessed the Knights in their Crusade to rid Novgorod of the orthodox pagans. 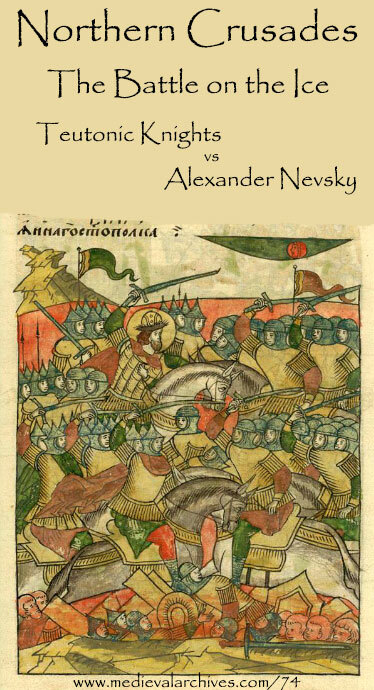 Alexander Nevsky and his army had other plans. They intended to defend their country from all invaders. The conflict ended with a fierce battle, called the Battle on the Ice. On a frigid day in April the two armies met on the frozen ice of Lake Peipus. If the Teutonic Knights were victorious they would stamp out the Orthodox religion and spread Catholicism throughout Russia. If Nevsky and his army successfully stopped the Knights Novgorod and Russia would be free of Western influence. Today on the Medieval Archives Podcast we’ll discuss the Northern Crusades and the Battle on the Ice.